Bring back childhood memories with a Carousel Cake! 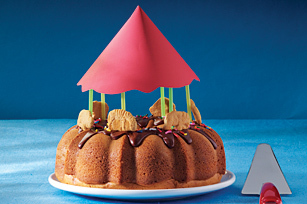 Yummy animal crackers help make our Carousel Cake perfect for a kid's birthday party—or your own. Beat cake mix, dry pudding mix, water, eggs and oil with mixer on low speed 1 min. Beat on medium speed 4 min. Pour into greased and floured 12-cup fluted tube or 10-inch tube pan. Bake 50 to 55 min. or until toothpick inserted near center comes out clean. Cool in pan 5 min. ; remove from pan to wire rack. Cool completely. Transfer cake to plate. Drizzle with Semi-Sweet Chocolate Glaze; top with sprinkles. Let stand until glaze is firm. Decorate cake with crackers and straws as shown in photo. Substitute 1/2 cup ready-to-spread frosting for the Semi-Sweet Chocolate Glaze. Place measured amount of frosting in microwaveable bowl. Microwave on MEDIUM (50%) 15 sec. ; stir until smooth. Use as directed.